James Melvin “Jimmie” Lunceford, a popular band leader during the swing era, was born near Fulton, Mississippi, in Itawamba County to James Leonard and Beulah Idella Tucker Lunceford in June, 1902. His grandparents, Daniel and Gracie Lunceford, had arrived in Mississippi as slaves from North Carolina in 1860. The Lunceford family moved to Oklahoma around 1910 and then to Denver, Colorado, where they maintained a home for many years. There, Lunceford studied music under Wilberforce Whiteman, the father of Paul Whiteman, a prominent white musician and band leader of the 1920s and 1930s. After high school, Lunceford made his way to Fisk University in Nashville, Tennessee, and graduated with a bachelor of arts degree. For a year, he studied as an undergraduate at New York City College in New York. He then took up teaching high school students in Memphis, Tennessee, where he formed his first band with fellow staff and former students. They were called The Chickasaw Syncopators originally but upon their tour of New York became known simply as Jimmie Lunceford and His Orchestra. In New York, the band went from dance to dance. 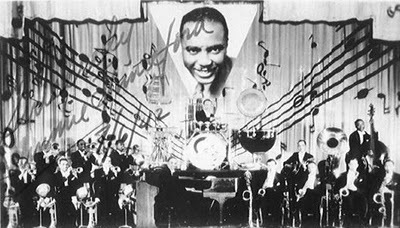 Eventually, through the help of Lunceford’s manager, Harold Oxley, the band was signed to play the famous Cotton Club in 1934. Lunceford and his musicians stayed there for several years, gaining fame to the point where they were hailed as among the best bands. Soon after playing the Cotton Club, the band recorded for Victor Records only to find poor sales. It was then that Lunceford signed with Decca and saw major success. Recordings of “Jazznocracy,” “Uptown Blues,” “T’ain’t What You Do,” “Lunceford Special,” and “Rhythm is Our Business” were among the most popular. The band also appeared in short films. Lunceford then propelled his band further by touring the country during the late 1930s, playing for enthusiastic audiences coast to coast in ballrooms and at college dances. The band mostly did one-night shows and was constantly on the road. Lunceford toured Europe in 1937 and returned to the jazz circuits throughout the country before war broke out. The Lunceford orchestra was not known for tremendous soloists like other bands but was successful based on its precise ensemble work and showmanship. Although influenced by vaudeville and novelty acts in their performances, Lunceford maintained a serious, professional group of musicians. The band at certain times included in its ranks such names as Sy Oliver, Willie Smith, Eddie Durham, and Gerald Wilson. During the Second World War, Lunceford struggled to keep his band employed just like other major band leaders. Scarcity of money and deepening personnel problems resulted in the diminished prominence of the band. After almost twenty years as the leader of his own orchestra, Lunceford collapsed while signing autographs for fans in Seaside, Oregon, during a tour of the Pacific Northwest in 1947. He later died of a heart attack. He was forty-five years old. Eddy Determeyer, Rhythm Is Our Business: Jimmie Lunceford and the Harlem Express (Ann Arbor: University of Michigan Press, 2006); Leo Walker, The Big Band Almanac (Pasadena: Ward Ritchie Press, 1978); http://itawambahistory.blogspot.com/2007/06/orchestra-leader-jimmie-luncefords.html.